What's Up with Bike Scofflaws? I felt it was time to take a look at a hot topic: bike scofflaws. You know, those evil law-breaking cyclists that supposedly snub society -- especially drivers -- in their quest for anarchy on roadways and sidewalks across the U.S. They run lights and stop signs, ride on sidewalks and cycle against the traffic on roadways. They are incorrigible and must be stopped!! Surprisingly, some bike advocates join in and pile on these supposed "rogue" riders in an effort to convince them to toe the line, respect all traffic laws, set a good example and perhaps not give the haters more to scream about. This misguided attempt demonstrates a flawed premise: that strictly following traffic laws will improve cyclists' safety and relations with drivers on the road. In a utopian society where everyone is looking out for each other and holds the law in high regard, that should work. Unfortunately, our society does not qualify. For decades cyclists have been vilified on U.S. roadways. They have been buzzed, screamed at, targets of hurled projectiles and even deliberately run over. Many drivers have made it clear that they have no tolerance for cyclists, do not want to see them on the road and feel that they do not pay equal taxes. You'd be hard-pressed to find a more widespread, open prejudice in this land than the one against road-riding cyclists. That's right. Think about it. The anti-bike fervor is so great in this country that many make no attempt to be politically correct about it. In fact, they proudly extol their beliefs online and on the radio that bikes do not belong on roadways. Check the comments section on most any article on the subject of bike and car conflicts. The bike bashers unashamedly swoop down, like vampires to fresh blood. I got news folks; the law is not the gold or universal standard here that idealists would have you believe. If it were, the bike-haters wouldn't have a leg to stand on. For you see, bikes are legally permitted on most roadways, and that is a law that many drivers have absolutely no use for. So much for common ground among law-abiding citizens. The underlying issue here is one of differing attitudes and their respective behaviors and the prejudices that can result. Not necessarily what's wrong or right (that has become subjective regarding this subject), or even legally correct. I'll take a closer look at these differing mindsets of bike "scofflaws" and anti-cyclists in part 2 on this topic. Before I delve into the psyches of drivers and cyclists, let's clarify a few points and perhaps dispel some myths. Drivers also break traffic laws (see video). I won't waste time on who is more expert at this. It serves no useful purpose. In many cases where a cyclist is injured or killed by an automobile, the legal system delivers justice by handing the driver a traffic ticket. While cyclists are sometimes ticketed for 'taking the lane' in a legal manner, in order to ride safely on the road. These last two examples help forge the mindset of many roadies. They realize the legal game is often played against them. And the lack of legal repercussions for taking them out (dooring or running them over) only emboldens many drivers, thereby making the almighty automobile even more threatening and dangerous. The roadie quickly learns that the golden rule on the road is survival. Traffic laws are secondary at best, for some. Not even on the radar for others. The driver's perspective is not hard to understand, because we've all experienced it at one time or another. For many drivers, their real beef is that they wish to buzz around in their cars and trucks as quickly and as unimpeded as possible. Anything that interferes with that plan is a pain in their neck, including: orange barrels, detours, traffic jams, farm machinery, rising fuel prices, and of course, the idiot cyclist. When drivers scan the roadscape to assess various obstacles in their path, they begin to rationalize: The orange barrels are a plague, but at least the road will be fixed, so it serves my needs. The traffic jams are a pain, but there's nothing I can do about infrastructure. The idiot traffic planners didn't design a proper system / didn't build enough roads. Farmers, well, their hay wagons and combines are usually on country roads and I suppose they have a right to earn a living and grow my food. High gas prices are the government's fault due to their allowing us to become slaves to foreign oil. Nothing I can do there but pay through the nose. But cyclists, oh - no! They have no right, reason, excuse or need to be on my road. Get them the hell off! These rationalizations speak for themselves. But a key difference here is that when it comes to cyclists, many drivers become irrational. Bike Advocate: You know, cyclists are legally permitted on roads. Driver: I don't care to acknowledge that. They don't belong there. BA: Cyclists do commute to work and school. Driver:	Don't care; find another way without spending taxpayer money on another bike path. Ride on the sidewalk. BA: That's illegal in many places. Driver:	Don't care; cyclists don't obey laws anyway. They can take their spandex butts to the sidewalk. BA: Not all roads have sidewalks. Driver:	Are you stupid or something? Don't you get it? I DON'T CARE - JUST GET THEM OUTTA MY WAY! These attitudes are not uncommon. They are "an irrational attitude of hostility directed against an individual, a group, a race, or their supposed characteristics." Sound familiar? That's right, prejudice, in all its glory. Now, let's take a guess at how many drivers on our roads today share this not-so-uncommon attitude -- 10%, 20% -- more? Considering the large volume of auto traffic on many roads, even 1 in 10 would be a crushing number for cyclists who have to deal with these drivers. But there's more. Technology has pushed distracted driving numbers to record highs. So, let's factor in "good" drivers who are no longer paying proper attention to the road. Then toss in drivers with bad or eroding skills due to advanced age or other factors. Only then is the picture made clear regarding this public survival zone that challenges cyclists on a regular basis. When one views this big picture through the cyclist's glasses, it's not hard to fathom why many pay little attention to traffic laws. But remarkably, some bike advocates still don't get it. Are they idealists? Perhaps. Realists? Perhaps not. So, now that we've examined attitudes, let's look closer at the dynamics on the road. And the behaviors that determine how scofflaws ride. I'll sum things up in Part 3 below. Time now to make some sense of these competing behaviors. Let's look at the bike lane placed in the door zone on a typical street. Some of you are already raising the red flag at this dubious placement. But this example illustrates how complete streets differ from traditional ones that try to include cycling infrastructure as an afterthought or add-on. Indeed, traffic planners don't always get it (bike infrastructure) right. Let's start with the drivers parking their cars. Will they look out for cyclists before exiting their vehicle? As a general rule, many of us are less mindful and more distracted these days. While others will simply forget to look before flinging open the driver's door. The potential victims in this case, cyclists, are familiar with this behavior and compensate accordingly. If they feel there's enough space, they may ride along the far left edge of the bike lane to avoid getting doored. If space is not adequate, or cyclists aren't sure, they are likely to ride with traffic and ignore the bike lane. In this example, what appears to be scofflaw attitude is in fact self-preservation at work. That's not to say that all bike scofflaw behavior is justified. 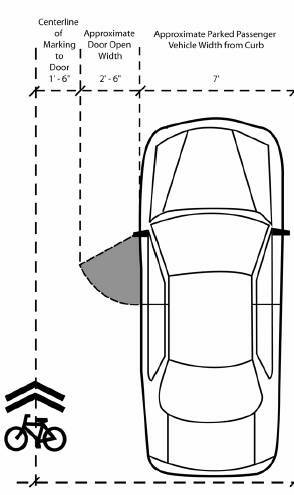 Nor is passing a cyclist in your car without leaving a safe buffer zone. But that is also a common practice. Fortunately, some laws have been drafted with supposed scofflaw behavior in mind, like rolling through a stop when there is no cross traffic. The 'Idaho Stop' law addresses and allows this behavior. The video above explains why it's not reckless or dangerous, when executed properly. Other laws are catching up with what's happening on the road as well. The 3-Feet Law is becoming more popular since drivers routinely brush by cyclists at close quarters. Texting-while-driving has become routine enough for many cities to ban this practice of dangerously, distracted driving. But new laws take time to develop and implement. And once they're on the books, compliance and enforcement are not guaranteed. So in the meantime, how do we solve the often adversarial relationships between cyclists and drivers? Education. While many cycling advocates believe "driving" your bike like a vehicle is the best educational approach, I disagree. Education can change the dynamics on the road, but not when it's directed primarily at those at the low end of the pecking order. Until all road users are better educated on how to share these public corridors, and better bicycle infrastructure is in place, you won't find many cyclists there. Until 'Share The Road' was launched in recent years, virtually no such effort existed in this country to better educate drivers regarding bikes on roads. It's no wonder that road cyclists have been vilified for decades. Perhaps more of this "in your face" marketing (signs, sharrows, etc.) will prove to be effective and go a long way to changing antiquated, adversarial behavior. It's certainly a good starting point.